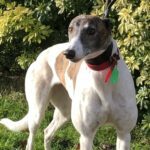 Greyhound Lifeline > Greyhound Lifeline Blog > Paul’s Greyhound Blog – Dodger Says Ouch! 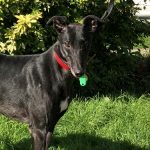 Paul's Greyhound Blog - Dodger Says Ouch! It was Friday 9th March 2012 and the day started just like any other; woke up went out for my morning walk, had breakfast then a morning snooze. So far so good, what could go wrong? Later that morning the youngest of the humans in my family and her boyfriend introduced me to his dog – a Labrador Collie cross. He seemed like a nice boy, a friendly playful chap and just the sort of dog I like. Ok then it’s into the garden for playtime. We chase each other around bounding and prancing about like young dogs do. 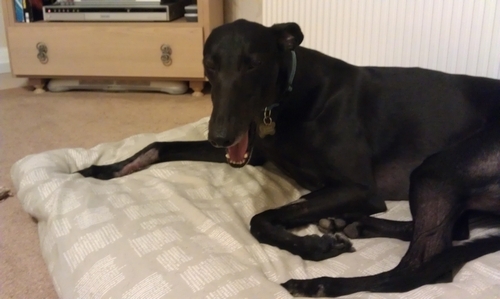 Of course I am much quicker than him, I am a retired racer after all. Suddenly I give out a loud yelp and I have a very sore front right paw. Oh dear I seem to be bleeding as well and I hobble off to my bed! Mum arrived home from work to find my paw bleeding and immediately contacted my Dad, the Pack Leader, at work to tell him of my plight. He came rushing home from work, luckily he only works just down the road, and promptly whisked me off in the car. Where are we going? I can’t tell because I am lying down in the back of the car and can’t see out of the windows. We arrive at our destination and go inside a building. Now I know where we are – it’s the Vets. My word I didn’t think my injury was that serious! We sit in reception for a few moments until we are called into a small room where I am examined. The result is a dislocated dew claw and torn skin between it and the leg. After a discussion between Dad, Mum and the Vet I am handed over and left with the Vet. Why is that? I am taken to another room with people in it then its all a blur and a mystery after that not sure what happened there. The next thing I recall is feeling really sleepy and there seems to be something wrapped around my paw which is now even more painful than I can remember from before. What has happened? Where are my family? After what seems to be an eternity I am led into the small room again and my family are standing there waiting for me. After another discussion we go out of the room, pay some money at reception and go out to the car. I am lifted into the car, I normally jump in, and off we go home. Through Saturday, Sunday and Monday I am really sore and I am given a number of tablets I don’t usually have. I have to have a stupid bag put over my dressing and have to be led out into the garden on a lead to do my toilet duties. What am I a puppy again? Back to the Vet on Tuesday for the dressing to be removed and the injury to be checked. 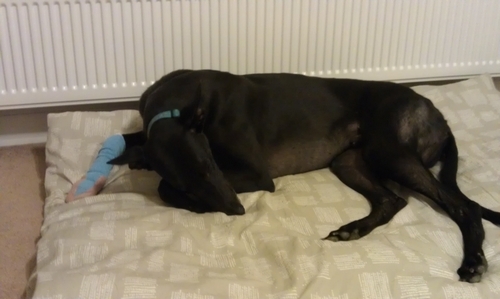 All is healing well, but for the next ten days I have to be kept calm, no running about and no licking the injury. I wonder how my family will stop me doing that? Oh I see I have to wear my muzzle when left alone – that’s not fair. Oh and I have to sleep with it on as well! That stupid bag is still on my foot when I am out and I am road walking again, gradually building up the distance day by day. Back to the Vet for the final time on March 23rd to have the stitches taken out. I was a very brave boy, no fuss or protest. My family say I was a model patient whatever that means. April 2nd, ten days on from stitches out and I am back to my old self again fighting fit and full of beans, in fact my family say I’m more lively than ever. It must be all that pent up energy from when I was kept calm. Despite the pain of the injury and my wondering what on earth was going on, I now know and recognise how much my family love and care about me and that my wellbeing is paramount to them. I am very grateful to them, very glad to be part of the family and will love them forever. Poor Dodger! Glad you are all better now!